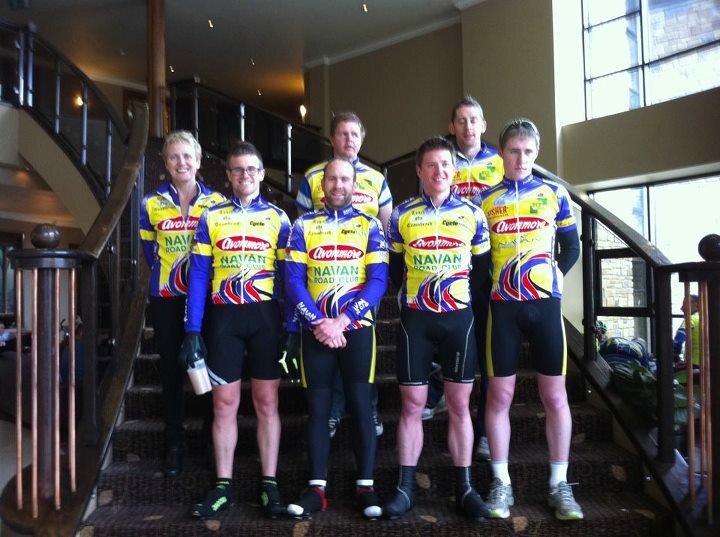 Over the Easter bank holiday weekend Navan Road Club sent 4 club members to compete in the 46th annual Gorey 3 Day stage race. John Kenny, Declan Byrne, Aidan Wall and Simon O Dea all went into the race on the back of some good recent performances, so hopes were high for a successful weekends racing. Club members Niall Dogget, Marie Byrne and Brian Moran also travelled down to assist the team with support vehicles etc. Blessington – Gorey, 100km. 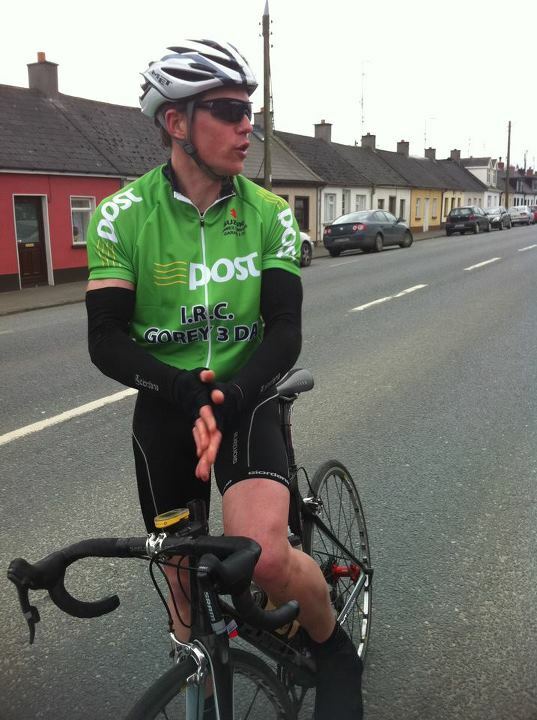 Riders were blown down towards Gorey with a strong tail-wind which kept the pace at 45km/hr! They had to negotiate 2 stiff climbs in Hacketstown and Carnew which split the group into pieces. Aidan Wall recovered well from a dropped chain on the first climb to regain contact with the peleton and finished strongly along with John and Declan in the main group. A small group of riders had broke away near the finish so the lads were 19 seconds down on G.C by the end of the day. It was a hard and fast start to a busy weekend and the lads were glad to be finished. All eyes turned to the next mornings Time-Trial. 6.4km Individual time-trial. Riders were sent off in 1 minute intervals. -Next up was a very pumped up and ready John Kenny who posted an incredible time of 7mins 23secs firiing him into the lead. -Declan Byrne started only 1 minute after john and posted a very respectable time of 8mins 03secs. -Simon O Dea was our last man off the start line and he certainly had recovered well from a hard stage yesterday to post a time of 8mins 02secs. We new at the time that Johns time was going to be hard to beat, but we could only just wait and see how it would unfold. The news came through soon after the finish that John had won and won well.! His nearest challenger was over 10 seconds slower. It was a great victory for both John himself and for the whole team, so the lads were in great form as soon as we got the news. His specific training for this TT had really paid off ,and by the way his average speed was a staggering 52km/hr…! The stage win also put John into the Green Jersey for the afternoons stage,and only 2 seconds down on G.C. Could the lads defJohns position and the jersey..? 4 laps of a 24.1km circuit arond Gorey/Craanford. With John in the Green Jersey the guys reallly stepped up their level. The stage was filled with attacks and the guys kept near the front of the bunch all day and were in the thick of the action. A dangerous break had got away on the last lap, Declan and John spotted the danger imediatedly so they rode hard to bring them back and defend their G.C ambitions. The reak was soon brough back and it all ended in a bunch sprint. John Kenny was well positioned and although he didnt really go for the sprint he finished 8th on the stage keeping him in 2nd place on G.C. Unfortunately he lost the green jersey, but everyone was very happy to be finished a long days racing. All the guys had rode extreemly well today and spirits were high. Gorey – Blessington 93.18km. Finaly we were heading home.! The weather had turned nasty, the race was faced with a wet + windy day ahead. John Kenny was sitting in 2nd place only 2seconds down on the leader so all was still to play for. Racing began with a bang and early into the stage a large group of 20 riders got into a break-away. The guys were not far away but decided to let some of the other big teams pull it back. Navan had a relatively small team of 4 riders, while some teams had between 10 and 20 riders, so it wasnt up to us to do all the work.! However in soon became clear that the peleton was very slow to organise a chase back. Johns 2nd place was slipping away so he and Declan hit the front and worked tirelessly to try and salvage a result. They rode themselves into the ground all day, but they couldn’t bring the break back. The break finished around 2mins ahead of the peleton in the end. All 4 Navan riders finished stronly, but they were wrecked. !……they had given their all and represented the club so well all weekend. Well done lads .! You did us proud. !